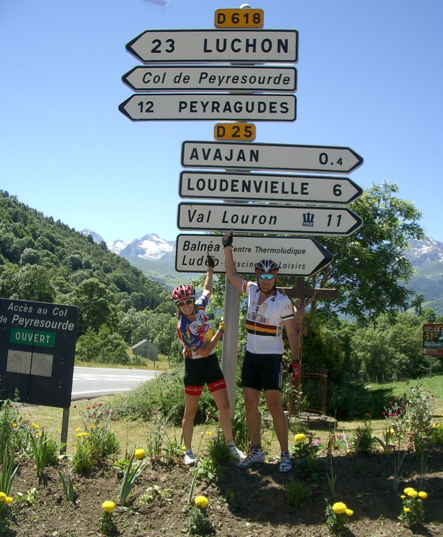 200,000 visitors from around the world have come to visit Pedal Dancer because they have an interest in cycling. 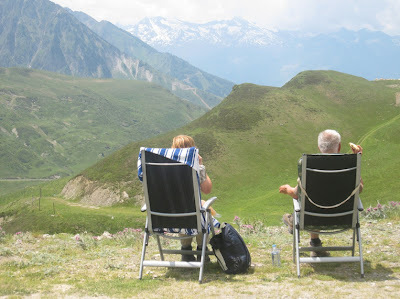 As I sit here reflecting on progress and 200,000 visitors, I cannot decide whether to write about races, bikes, climbs, travel, customs, food, language, sponsors, fans, history, tour routes, or equipment, because I have a deep awareness that we all come to this sport with our own story, looking to make our own history. I have a dear friend who regularly tells me "you will talk to anyone." Yes I will, because I am truly interested in their story. I am tremendously curious about the experiences of others. It fuels my quest to ask more questions and hear more stories, meet more fans, arrange more interviews, take more photographs, and attend more races - so that I may bring these stories to you in the future. 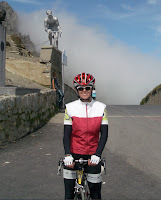 I know my story; I am drawn to cycling for the joy of riding a bike on a long winding scenic road climbing to the clouds with broad expansive views and steep grades that clear my mind to the point that my only focus can be that of keep going, I can do this, and wow isn't this beautiful! I live with the "why put off until tomorrow" approach to life. It is more than the joy of conquering new climbs, I love the pageantry and history that surrounds the sport of cycling, the unknown of competition where predictions seldom match outcomes. I love the preparing of bikes, the planning on maps, the expectations, the celebration and endless retelling of stories afterwards. I do not know your story. I am interested because your story is news. 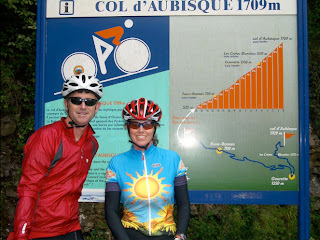 Four nights ago I ran into a friend at my local gym at the nearby University of Denver, we realized in a quick conversation that we both had been on Plat d'Adet in 2005 to witness George Hincapie win a stage of the Tour de France. We had recently ridden bikes together out on the road, but before she told me this story, we never realized that we had been within 100 meters of each other on the same mountainside in France years before we ever met. 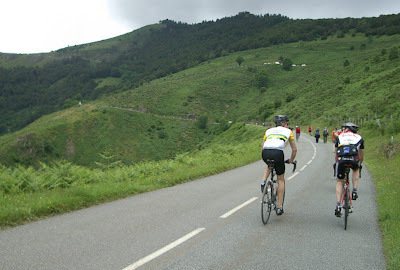 Sometimes I think of cycling as a small sport in comparison to other sports, but that makes the odds even greater that we will some day meet in this very small world. Speak up and share your story, we may have a lot more in common than you might think. Pro riders are not the only story to be heard, every rider whom you pass or who passes you on a bike, every fan along the road, every person who works on the fringe has their own inspiration for being drawn to cycling. If you ever see me out on a mountain pass or at a race - please, stop me and tell me a story. I know I will be all the better for it. Thank you to the over 200,000 visitors to Pedal Dancer from 170 countries in 13,500 cities around the world. That is a lot of stories. 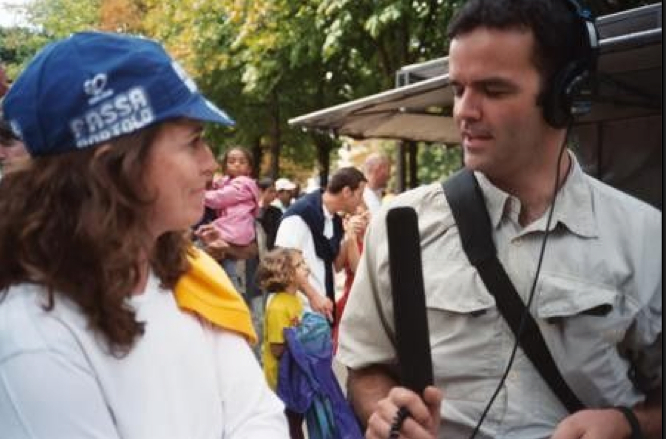 This is me above, in Paris at the Tour de France in 2003, being interviewed by National Public Radio. 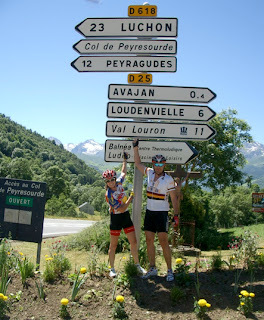 When I returned from this trip the idea of Pedal Dancer was conceived (the blog was started after the 2010 Paris-Roubaix). 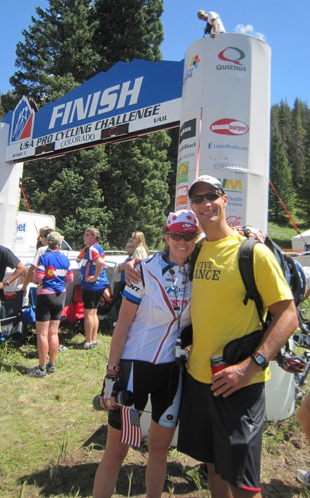 Who knew that my story would evolve into interviewing others and attending hundreds more bike races. Who knows where your story will take you.